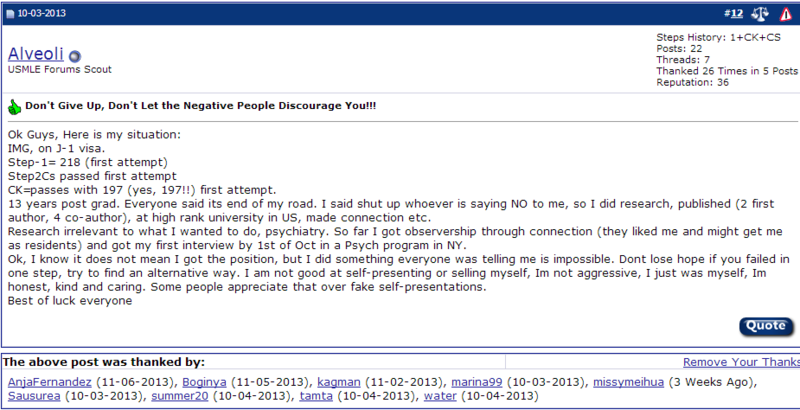 I have been reading your extremely positive notes in this forum. Can you send me the Interview notes you made to [email protected]? Just for the record. Notes sent to emails above. All the best to you all. Notes sent. All the best in your IVs. Hope we all match! Hey guys whoever was on Interview today in my program text me . Good luck!! Thank you so much! Good night and best of luck everyone!!!! any IV experience for cook county please! tamta where are you working? Hi! If someone can please share Tamta's notes with me. As everyone is starting to think about interview preparation, we want to stress a few things. First, nail the top 10 most common questions instead of trying to have an answer for everything. Remember, you'll only have 2-3 interviews that usually last 30 min (or even less). This basically means that you'll only have time for 4-5 questions. By nailing the most common, basic questions, you build great momentum. Remember, first impressions are absolutely critical. Stumble on "Tell Me About Yourself" and you may never recover. 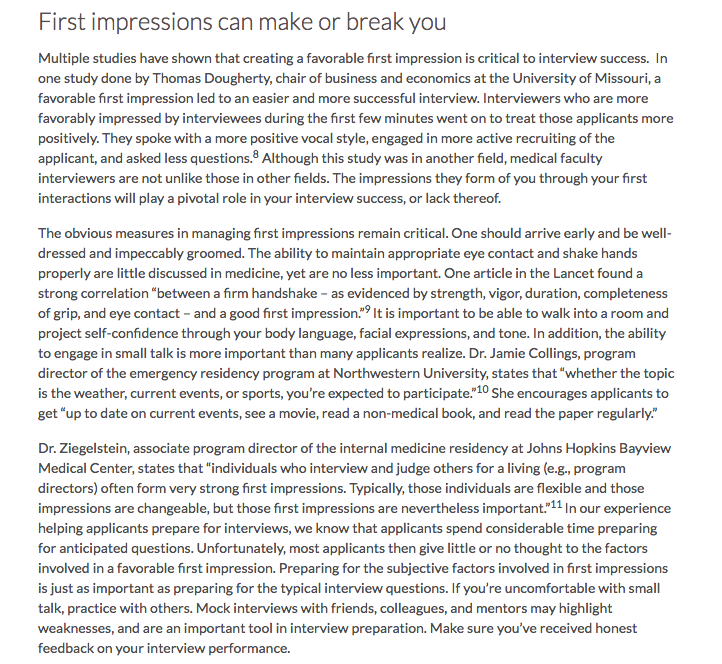 We have tons of free tips on succeeding in the residency interview. Check out our blog. Thank you so much. This was really helpful! hi! someone please share the notes with me too! Can you please send me the notes to [email protected]. Could you please share your notes about interview with me? I learnt so much from this forum. Please someone send me the interview notes at [email protected]. 1535715469 at qq.com me too please. Thanks a million. Thank you for sharing your experience. It gives many of us some confidence. Could you kindly share the interview notes. Thank you so much. good luck with everything. Hi Tamta, thank you for this great post. I have learned a lot from it. Could you send me your iv notes? Thank you very much for starting such wonderful post. As i am new to this site, so i can not post my email. Good luck with the interview season everyone! Can anyone attach the file here. Thanks. Can you please send me the notes as well. It is very much appreciated thanks. Hi, Tamta, thank you very much for your post! thank you for sharing all these information. My email [email protected], please, send me your notes. Please, can someone send me the notes? Thanks a lot for all your help and encouraging! send emails to programs and there coordinators to review your applications its helpful trust me very helpful. you are not loosing anything. I have to reassure lot of my friends that sending emails is crucial part, no matter you are a cool applicant or desperate. use some kind of like this template: address program coordinators and directors directly by their name, mention program by the name, individualize the letter. so here is template i have template int he post itself , and please post correct email addresses its painful for me to correct them and look into whats the problem why im unable to send group email. My name is ..., I am ... years old from small country Georgia. I have been trained in Obstetrics and Gynecology in Ukraine after Medical school graduation, I am in the residency match this year and your (write name of the program specifically) training program represents special interest for me. I would be honored if my application could be reviewed for interview and given any consideration. I am in US (New York, New Jersey, wherever program is or wherever you are) flexible and available to schedule an interview with you on a short notice, if there are any cancelations during the interview season. I did this research this many publications. I am a very good listener, good learner and self-sacrificing team member, I am dedicated to maternal and fetal care, and I would excel in my training in best way possible..
My passion to Medicine and healing, patient oriented strong work ethics will help me excel in my training in best way possible..I am a great listener, learner and self-sacrificing team member. I strongly believe you will not regret meeting me in person in case I am chosen for an interview, I am looking forward for the opportunity. Sorry let me try again wth email. Can someone please send me the iv notes, thanks. Hello, could someone please forward me the interview notes to piner10 at aol.com thanks. and you should read initial comments on this thread as well. there are interesting stuff. Thanks alot for writing your experience about interviews. It's really helpful. God bless you. Guys can anybody please share Tamta's Interview notes? Is there a way that I can contact you? I am looking for some information about a certain program and I was wondering if you can help me with that. I have provided my email address in the title of the message. Tamta, would you kindly send me your notes? Your story is really outstanding! I am also sending emails to program coordinators, but my template is much weaker than yours. I should learn from u. Last edited by ama_inc; 10-21-2016 at 06:12 AM. Last edited by chaosdefeat; 10-18-2016 at 05:22 AM. and this is AMA mainly Medicine residency and fellowship vacancies. I initially interview in mu current program on prelim vacancy on this site. Also I heard qs about fellowships without residency yes there is possibility and if you have completes residency training in your country and are board certified in specialty you qualify and can equally to US residency graduates apply to fellowships. but it won't make you board eligible. but it is still some way to put your foot in. briefly: if you want to have any kind of serious career you need research. don't get discouraged if you don't match try to get into research, even after residency that's the only thing that will get you into competitive subspecialty. I am not the biggest of researchers, but I might go into research voluntary paid or unpaid afterwards to get where I need. anyways let me know if anything else I can answer. Just google Postdoc fellowships go to institution sites google people choose whom you would like to work with email them. they do respond, to a normal decent human emails and overall there are people looking for committed 1-2 year research candidates, cause everyone wants to quit and go and find residency. Research is a very good chance for living here as well as getting into training. My program takes lot of old grads with research phDs etc. Thanks tamta for your helpful attitude. I have one IM interview coming up and have no idea how to prepare for it. Your story about CS is really outstanding! I was also planing to send emails to program coordinators, but unfortunately I failed the CS while I had already got a couple of IVs and now I am trying to take it again and have the pass result ready before the rank order list submitting deadline. Do you think it is going to work or I am just wasting my time? Last edited by mehdirah; 10-20-2016 at 06:09 AM. It's Tamta. i dont know what your credentials are otherwise but failed CS itself will follow you everywhere. not just this year. but the fact that you do not even have exam in hand puts you in bad position this year. but you applied already so not doing anything would be waste of time and money you put it. You are not loosing anything . but I believe it will every hard to get interview with failed CS during match season without yet even a date to retake it. I have friends who matched with failed CS, al of them with some other friend putting a word for them, or them knowing someone they have worked with and demonstrated that failing CS does not mean one is not capable of being a good doctor and communicating iwth patients. Actually I have got already a couple of IVs and wondering if I can manage them in a way that works for me in this situation? But I still need to nail the IVs and your notes would be helpful; I sent my email address in PM. Really appreciate if you can kindly sent them to me, please! Do you have any other advice or recommendation regarding the IV for my situation in particular? your suggestions are really helpful. Could you please send me the notes in my email id .I would be grateful to you. Thank you Tamta. You're such a nice person. Thank you so much for posting. By the way,I'm IMG 2011 graduate, step 1 score 249,step 2 ck 241, CS passed 1st attempt, green card holder, applied this season. However, I'm kind of late applicant bc my cs result came out on october 12 and wait for LOR. Now I don't have any interview. This is my first application for match. And I don't know what to do for next. Plz kindly guide for me. Thanks a lot. you are a perfect applicant and very mildly late. email everyone hope you applied everywhere and just email them update them with CS results. email now , email in november, email in december twice. applies to everyone. I got most of my interviews in december after CS results. which was very very late. You give lot of hope to many people Tamta and your notes are great. Thanks for helping us out during this difficult phase of our lives. To be, or not to be a resident, that is the question ! Thank u so much tamta.